The Official Blogger Blog For AstrologyClub.org. The official source for news and updates of AstrologyClub.org site. An astrology chart is a type of graph that maps out the planetary positions at various times in relation to our times of birth. The astrology chart that is commonly used to determine the planetary positions in the various houses of the zodiac at the time of one’s birth is the Natal Chart. With an astrology chart one can analyze the planetary positions. The positions of the planets in relation to various charting aspects can reveal such things as personality traits, relationship compatibility, life’s obstacles etc. Some astrology charts are done to determine things like past lives and their influence on our life now. An astrology chart that is charted well can also give one their strengths and weakness in this lifetime. 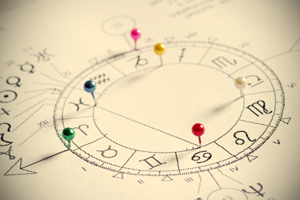 For an astrology chart to be accurate and personalized to the individual, the astrologer needs the exact time and date of one’s birth as well as location. With this information the astrologer can plot accurate angles between the planets and the zodiac houses to give the individual detailed information in the astrology chart. Most astrology charts are geocentric or based on the earth. Some astrologers prefer a heliocentric or sun based astrology chart method. When the exact time is not known rectification is used to create an astrology chart. Rectification is when the astrologer attempts to chart other significant dates in the subject’s life to get planetary information in relation to the subject. In addition to personality traits, an astrology chart can also look at ones past, into ones present and into ones future. In an astrology chart the planets can tell us various things about the subject who’s being charted. The Sun shows us at face value, how people first see us and shows our deepest goals and what we want in life. The Moon tells the astrologer how we respond emotionally and how we feel about things. The planet Mercury indicates how we express ourselves. Venus shows how we relate to others. Mars is an aggressive planet; it shows how we use our talents and energy to get what we want. Jupiter is about expansion. It shows how we expand our horizons and enjoy our selves. Saturn is a disciplinarian. It shows how much self discipline we exercise and our strength of character. Uranus is about our creativity as well as our originality and inventfulness. Neptune shows our humanity in helping others. Pluto shows how we can grow and increase our self-knowledge. In an astrology chart, depending on the location of the planets at the time of our birth we can see a relation of the planets to the zodiac houses to give us an understanding of who we are and what is going on in our lives. The zodiac houses are 12 equal parts that are 30-degree angles each representing a zodiac sign. For example the 1st sign in the zodiac is Aries. Depending on one’s time of birth determines what sign is in what house at that particular time with the corresponding planet. Some people think of Astrology and astrology charts as nothing more than superstition. Great and ancient civilizations such as the Egyptians the Mayans and other empires used such tools as astrology. Stonehenge is now believed by archeologists to be some sort of ancient clock based on the movements of the sun, moon and stars. Even scientists like Sir Isaac Newton stated he did not scorn astrology. Knowing a little about astrology can help people understand one another a little better and that can make for a more peaceful world, which is full of turmoil. Welcome to The Official AstrologyClub.org Blogger Blog! The official source for news and updates. Our work with astrology is process oriented. Combining astrology, psychology, the arts, education, and spirituality, we are intrigued by the many theories related to internal evolution and the development of consciousness. There are many ways to begin the journey of adding astrological insights to the life path.The natal horoscope provides the reference point. Through analysis of the symbols in the map, in collaborative dialogue, strengths and challenges are brought to awareness.